There are twenty-three shopping days left until Christmas. If you’re not already finished, here are some suggestions for Cape Region golfers. Everything in the pro shop at Baywood Greens, the Long Neck area public course, is now on sale at reduced prices. The shop is open from 7:30 a.m. to 5 p.m. daily (947-9800), and they are happy to sell gift certificates for tee times throughout the year. At Bear Trap Dunes near Ocean View (537-5600), Neal Maurer said they have a huge selection of clubs and other equipment geared for junior golfers. The pro shop is open from 8 a.m. to 5 p.m., and gift certificates are also available. Bethany Bay Golf Course’s pro shop is running a special on Etonic Stabilites shoes at only $39. The Bethany area executive course (539-3833) also sells gift certificates for tee times. Mike Connor of The Golf Park at Rehoboth (227-2500) said their golf shoes are now selling at only 15% over cost. Shirts and shorts are discounted at 40%, and gloves are 25% off. Everything else in the pro shop is priced at 10% off, including clubs. Connor says to come on down and “make an offer” between 9 a.m. and 4 p.m. daily. Kings Creek Country Club scheduled its annual Christmas sale for December 9. Head pro Ty Mayers said his shop will be open that day from 8 a.m. to 8 p.m., with everything in stock marked down from 15% to 50%. The Rehoboth area course (227-8953) is normally open from 8 a.m to 5 p.m, and Mayers said he’s also running a special sale on golf balls. Rob Marshall of Old Landing Golf Course (227-3131) is also selling golf balls and gift certificates for tee times at the area’s oldest public golf course. His shop is open daily from 9 a.m to 3 p.m.
Head Professional Ron Barrows is tempting golfers at Rehoboth Beach Country Club with a Christmas special on Cobra golf equipment. Cobra Gravity Back irons, normally priced at $872 per set, are now only $550. Cobra Woods that were $375 can be had for $250. Barrows’ pro shop is open daily until 5 p.m., and it’s well-stocked with many other opportunities to spend a dollar or two. At The Rookery, the new Milton-area public course is celebrating its first Christmas with a special Ladies’ Day sale on December 9. Head professional Butch Holtzclaw is ready to help women looking for help buying golf items for their golfing spouses. The shop’s merchandise includes many logo items, and their gift certificates are also good for lessons and tee times. Their shop is open from 8 a.m. to 5 p.m. daily (684-3000). Ed Larkin of the Rehoboth Golf Day store said that the soon-to-close store is running low on inventory. As it completes the liquidation process, remaining items are now at 30% to 50% off. At the rate they’re now selling, Larkin is not sure the store will remain open through the end of the month. 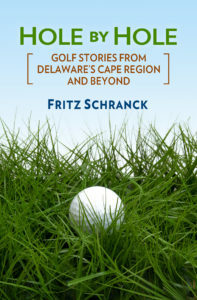 With all these options, there should be no problem finding a great gift for your favorite Cape Region golfer.